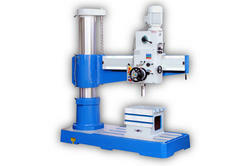 We have in store an excellent range of Radial Drill Machines, which is expertly designed by our team of engineers. This team also ensures that the sophisticated technology used to manufacture the range is completely in accordance with the industry standards and guidelines. 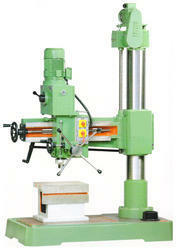 Rigid head stock and main spindle mounted on taper roller bearings ensure vibration free cutting. 40/900BFN & 40/900BA Back geared assembly designed by four side bearing based fitting to with stand heavy load. Spindle assembly balanced by guided counter weight. Automatic disengagement of power feed at reuired depth of drilling. 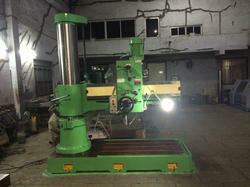 Drilling head having taper guide ways with taper wedges provide strength to with stand heavy cutting force. Machine over all casting material is high quality closed grain casting. 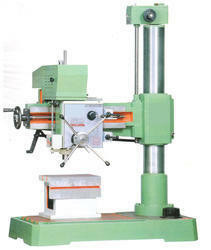 Main spindle is made out of EN-8-D alloy steel material & grinded finsih. All the gears is made out of 20MN-CR-5 material and Hardened & grinded finish. Worm Gear is made out of EN-24 material. Lifting screw nut and auto feed worm gear is made out of Bronze Metal. Time saving & rapid production due to single gear changer. 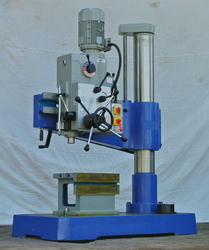 Rigid head stock and main spindle mounted on taper roller bearings ensure vibration free cutting . Arm lifting motor is direct geared assembly and auto -up down. Each and every gear & friction feed gear is with bearing fitted . Splash lubrication for feed gearing. Gear Box is fully oil bath. Automatic disengagement of power feed at required depth of drilling. 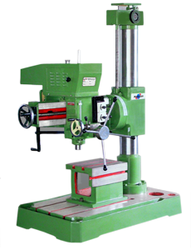 Main Spindle is made out of EN-8-D alloy steel material & grounded finish. All the gears is made out of 20MN-CR-5 material and haredened and grounded finish. Spindle shaft is made out of SAE-8620 material and hardened and grounded finish. 25/650 bf back geared casting material is made out of SI0412 graded casting. 40/900 bf back geared casting material is made out of SI0412 graded casting. 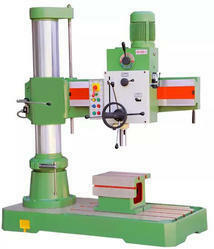 Looking for Radial Drill Machine ?